Darren Pickering of Pro Sharp Services is a Flamin' Sharp Licensee and your Mobile Sharpening Specialist. We come to your home, your workshop, business or building site to provide you with up to date, state of the art sharpening for most of the gear that people use in the day to day running of your home or business. Sharpen your knives, scissors and tools. In our modern, throw away society, people find it refreshing as well as economical to have their tools and implements re-sharpened. The appreciation grows through the convenience of us visiting you to sharpen 'on site' be it At Home or At Work within Greater Adelaide, Murraylands, Adelaide Hills, Fleurieu Peninsula to the Riverland and everywhere in between. At Pro Sharp Services, we will continue to meet each customer's needs in a friendly, innovative and cost efficient manner. Pro Sharp Services's goal is to deliver market leading levels of service and workmanship. CONSISTENTLY EXCEED CUSTOMER EXPECTATIONS WITH OUR INNOVATION AND FRIENDLY NATURE. QUALITY OF SERVICE AND VALUE ARE OUR HALLMARKS. SERVICING: Greater Adelaide, Murraylands, Adelaide Hills, Fleurieu Peninsula to the Riverland and everywhere in between. BOB TURNER - FLAMIN' SHARP PTY LTD. 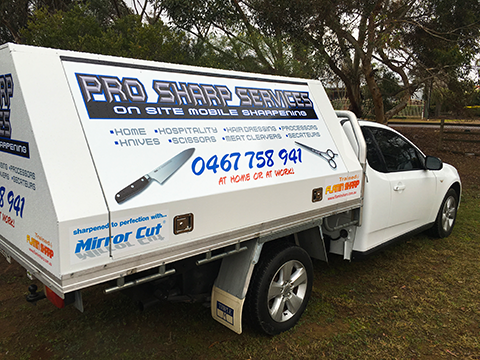 Pro Sharp Services is an independent licensee of Flamin' Sharp and uses © Mirror Cut technologies.